There are some months when a collection of photographs is necessary to remind me all that has been accomplished. This has been in no small means because I am very focussed on working towards my next solo exhibition in October. It is sure galloping towards me at a very fast rate. No, I am not sharing images of that, as all will be revealed in the exhibition. A fire was needed. 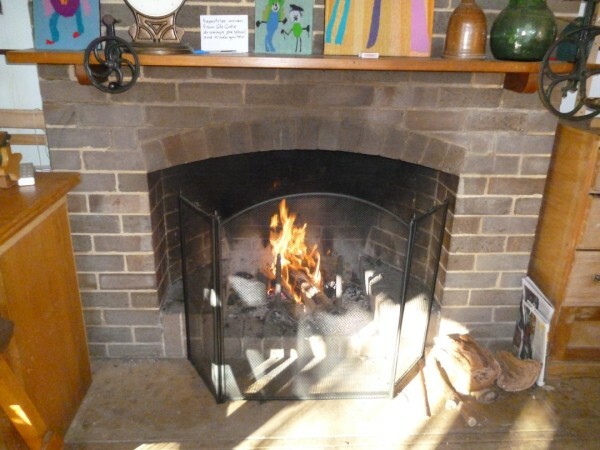 Some days in early August were bitterly cold and I did take the opportunity to light a fire. A pile of kindling and some ready cut logs, left over from the basketry weekend, why wouldn’t I? There just isn’t anything like a fire to add ambience to the weave studio. 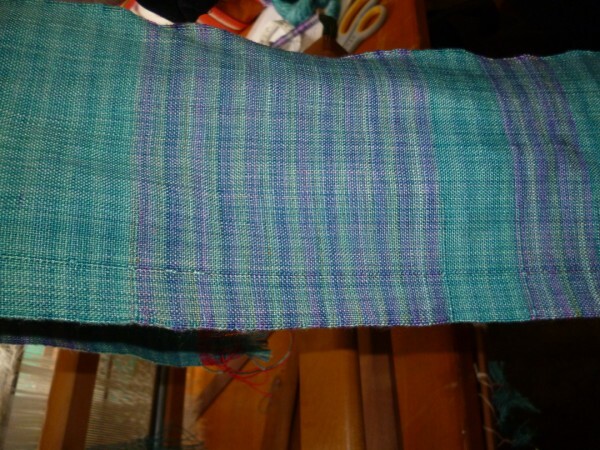 Ruth has cut off a second warp in variegated silk. 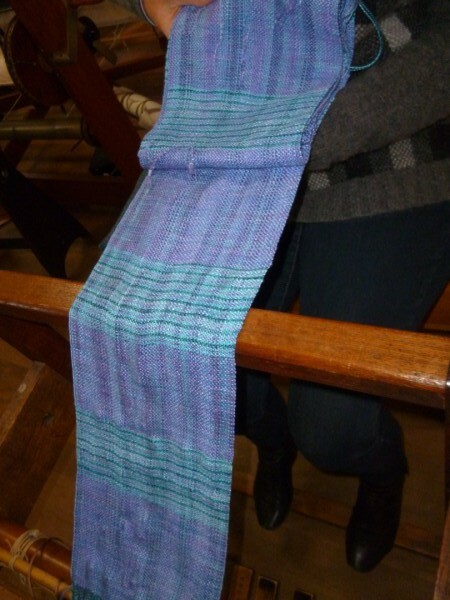 As she now intends making a garment, she decided that she’d weave two more narrow warps using the same silk in 3 varigated colourways but in different quantities. Because they have all been used in the main piece they will relate. Maggie has completed her first step in her project. She has been weaving a number of warps using old shirts. She’s got a major project in mind and at this stage is collecting lengths of fabrics using a component of cut up shirts in various structures and effects. 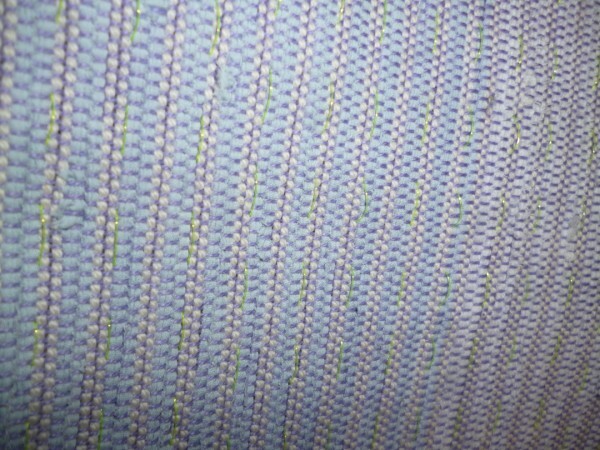 This purple warp was woven with fabric and a soft cotton yarn. She’s also woven it with weft shibori. If you look carefully, yellow fishing line for the resist can be seen. Next step is to pull it up and dye. 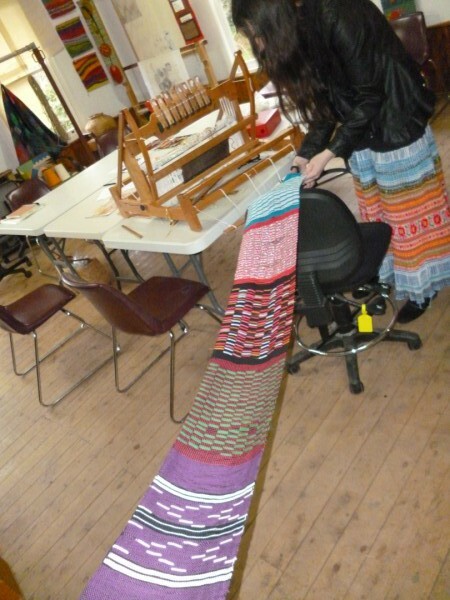 Left over from the Sturt Winter School and a saori weaving class by Kaz Madigan were a number of black warps. The sett is very open and suitable for weft faced textiles. 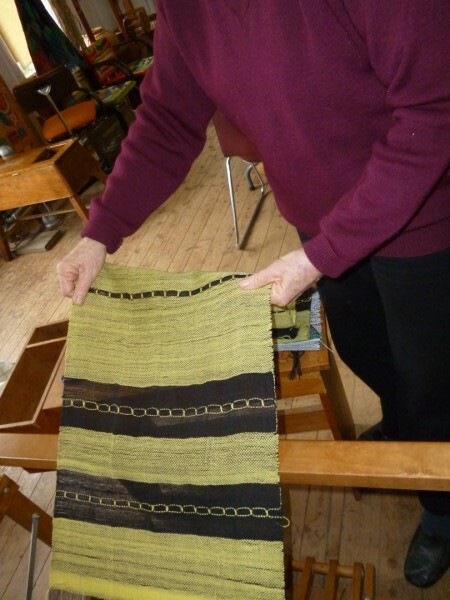 Bev took the opportunity of not having to wind a warp and thread a loom and wove a scarf using black and yellow for the weft and Danish medallions to add interest. Maureen is very pleased to have completed a challenging project. 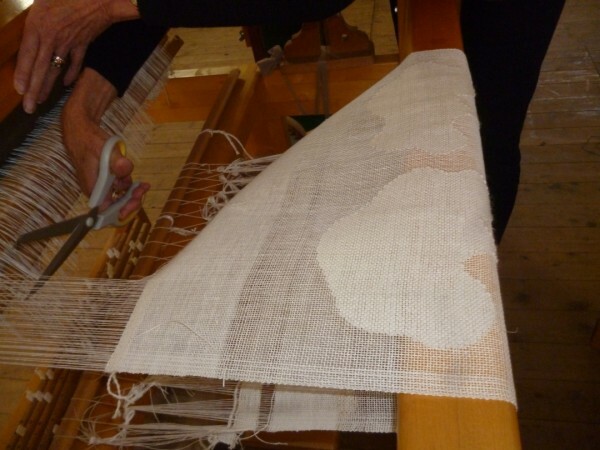 Some considerable thought went into the mechanics of weaving a transparency in linen. Weaving linen is not the best idea in a studio where the heater is constantly on. The warp needed to be constantly sprayed with water to maintain the yarns strength and to prevent problems with the selvedges. 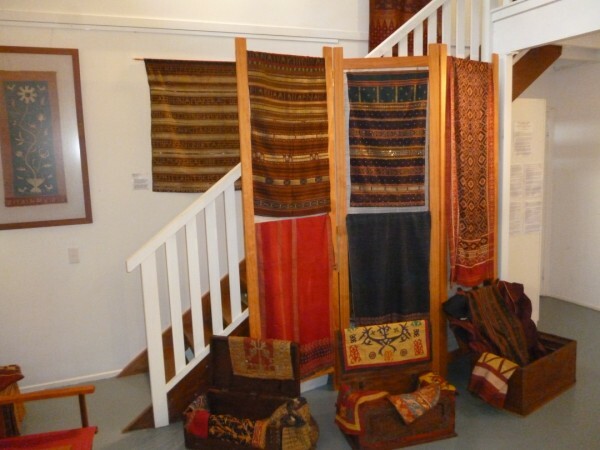 If the moisture levels were maintained during weaving, there was minimal problem. 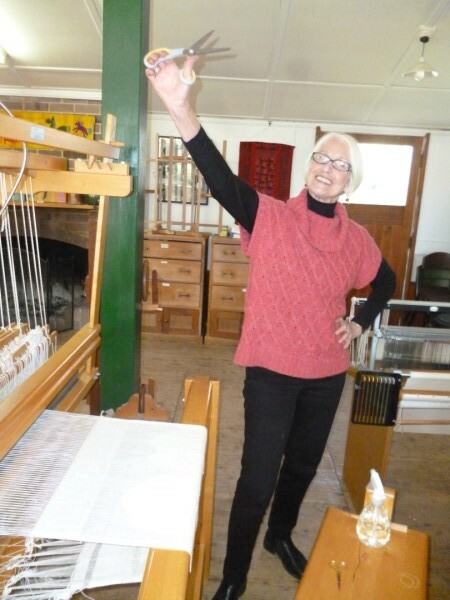 In addition Maureen discovered the mechanics of weaving using a transparency and modified the width of her design to enable reaching under the warp and avoiding drag by her arm on the selvedges. It has been a challenging project with a very beautiful outcome. As with all projects, it will be great to see it finished. Tuesday has completed a project requiring several new skills: a series of purses. First she wove bands on fabric in honeycomb. Then she sewed them up. 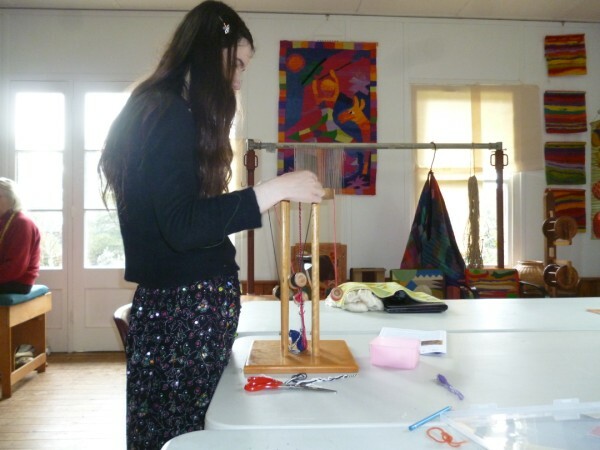 She had never used a sewing machine to sew a project before. And then she sewed on buttons; another new skill. 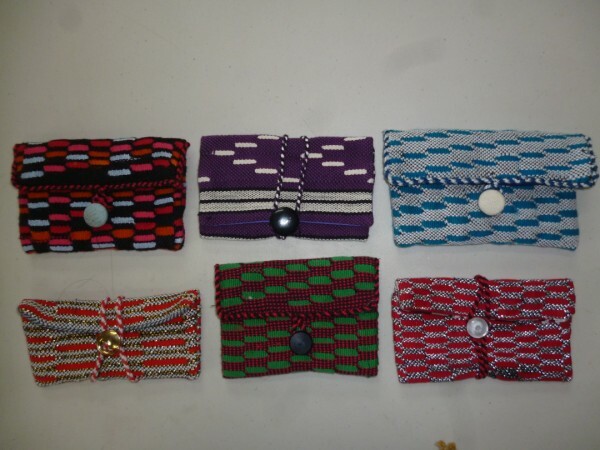 Then she made some braid on a marudai to match the purses: another new skill. Here they are all completed. During the month, I had to go back home to Brisbane. 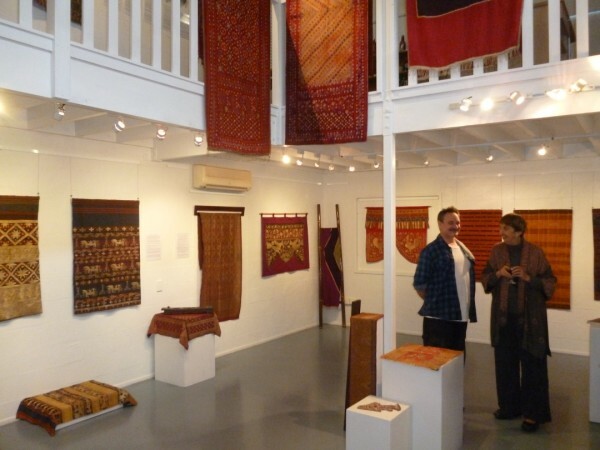 While I was there, I went to see an exhibition of South Sumatran Textiles at Gallery 159, The Gap. It was an amazing exhibition drawn from the collection of Greg Pankhurst. I hope evryone who could get to it took the opportunity. Gallery 159 is the TAFTA Gallery and details of exhibitions and all manner of interesting information can be found on the web: http://www.tafta.org.au. Janet de Boer was the prime mover in organising the exhibition. Here she is with husband, Peter admiring the works. It now seems a long time ago since a fire was needed. Yes, there are days when it is very cold but the balance is changing and you can feel spring around the corner. The changing garden at Sturt is a treat. 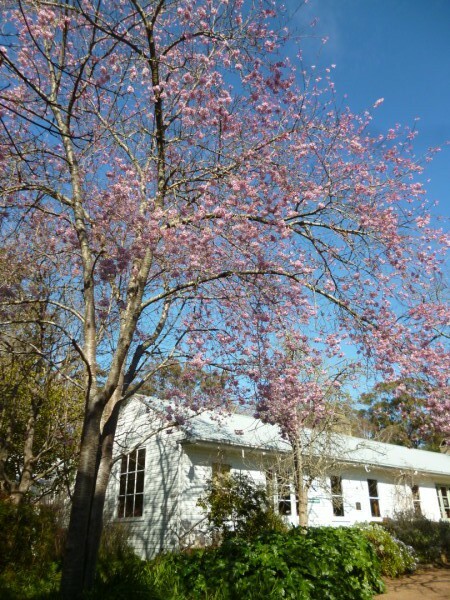 A flowering cherry infront of the weave studio. 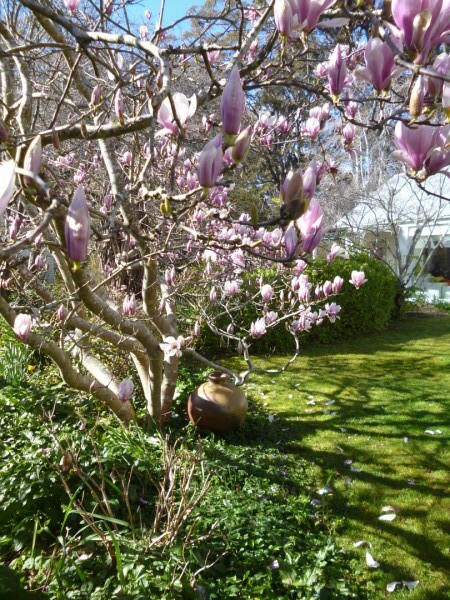 And a magnificent magnolia in another part of the garden. You are currently browsing the Kay Faulkner's Blog blog archives for September, 2014.